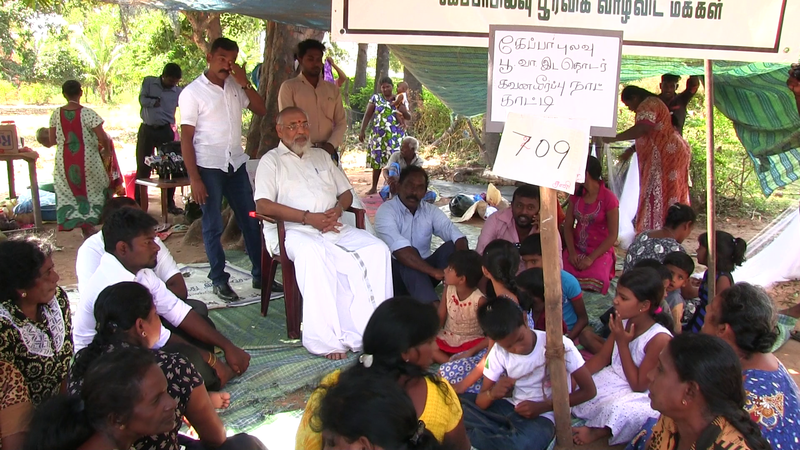 The former chief minister of the Northern Province C V Wigneswaran visited protesting Tamil families in Keppapulavu this week, stating the army had “no right” to continue its occupation of their land. Visiting the families on their 709th day of protest on Saturday, Wigneswaran said the military had a “duty” to return the land back to the Tamil families, who had been living there for generations. Wigneswaran said he had spoken to the Governor of Northern Province who had requested a further 6 months to deal with the issue. “I said that they asked for time before,” he added. “In truth, it appears that they are living lavishly when looking at all these trees and other resources in people’s lands." The former chief justice added that the continuing military occupation may be linked to Sinhalisation taking place in Tamil regions, noting that “encroachment by the Mahaweli Authority of Sri Lanka and their power has reached Mullaitivu”.